China’s Binhe Yellow River Bridge in Yinchuan has been illuminated using dynamic architectural LED lighting from Philips Lighting, designed by Shanghai Bright Language Lighting Design Co. The double-cable suspension bridge spans the entire width of the Yellow River and connects the city centre of northern China’s Yinchuan City with the Binhe New Area. At night, citizens can be amazed by a water curtain that is illuminated in rainbow colours, giving the impression that a waterfall is running right under the bridge. 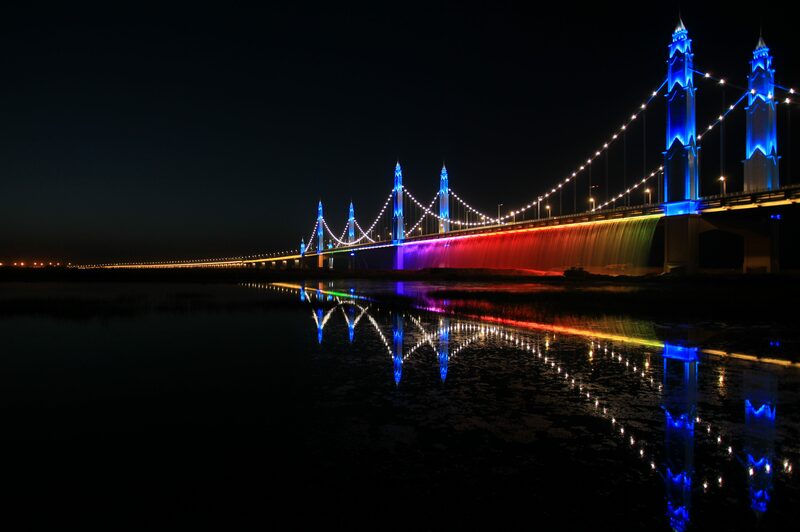 The Binhe Yellow River Bridge’s unique architectural design is complemented by Philips Color Kinetics technology that provides architectural lighting effects and gives the flexibility to change up to 16.7 million colours. Compared to conventional lighting, the new long-life LED system by Philips Lighting can deliver up to 75% energy savings as well as saving on operation and maintenance costs. The lighting used included: Philips Vaya Flood RGB BCP417, Vaya Flood MP RGB BCP414, Vaya Flood LP RGB BCP411, and Vaya Linear MP RGB BCP424. In addition, there was also a Philips ZCX400 multi-protocol converter and SSLCTR LRC9627 Ethernet keypad from Philips. After more then two years of construction, the Binhe Yellow River Bridge was opened to traffic in April 2016 and the lighting installation was completed a year later. The bridge is 6,587m long and eight lanes wide, supported by six 98m tall towers, each with cables that span to a total of 218m.